I LOVE KITCHENS – the good, the bad, the ugly… and the beautiful! They’re all either a challenge or an inspiration. Think about it. Kitchens are where we nourish and entertain our families and friends. We nourish our bodies with healthy, tasty food, and our hearts with fun and laughter as food is prepared and shared with those we love. The kitchen is where memories are made. (Who doesn’t want to be well fed and loved?) If your kitchen isn’t all these things, it should be and it could be. A new kitchen can be life-changing. Imagine having enough counter space, an oven that works, proper venting and beautiful new cabinetry with plenty of storage. Imagine not being too embarrassed to have people over. Wondering what the hottest, coolest kitchens will be like? Here are some trends seen by our kitchen trend setters and spotters. Kitchens are generally getting lighter, with more linear design elements. They include more contemporary or transitional cabinet styling with eclectic blends of light painted cabinetry in shades of warmer neutrals, contrasted by shiny dark woods and polished stainless steel cabinet doors with glass inserts, You’ll be seeing more use of almost-indestructible engineered countertop surfaces, long-lasting LED lighting, easy-to-care-for polished hardware and plumbing fixtures and appliances that listen and talk back. Your dream kitchen would have endless countertops and storage space, and feel organized, clean and classy. Or, a fun, youthful really contemporary shiny white kitchen with a whimsical, unexpected pop of color may be in your future – more your style and budget? It’s all good! A new kitchen will be a major investment in your home. The kitchen components are built-in, long-lasting or permanent, and expensive. Based on square footage, it’s usually the most expensive room in the home, and deserves serious thought and consideration before jumping into a major build or renovation. PLANNING – Do it right the first time. “If you fail to plan, you can plan to fail.” A qualified professional can save you time, money and disappointment, introducing stylish trends, smart solutions and inspiring ideas for your kitchen. The National Kitchen & Bath Association has developed “31 Kitchen & Bathroom Planning Guidelines” to help insure safety, accessibility and good planning practices for kitchen and bath design. 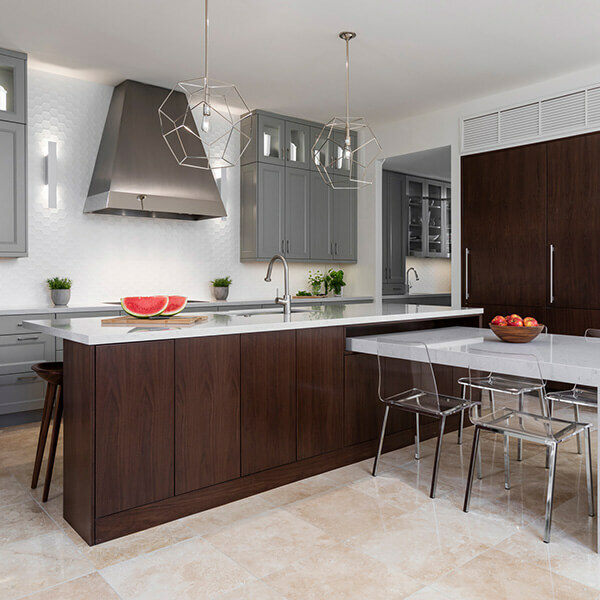 An experienced kitchen professional considers your personal needs and wish list, as well as the NKBA guidelines concerning traffic flow, clearances, appliance placement, ventilation, electrical requirements, lighting and much, much more. During the planning process, the aesthetics will be developed as well, resulting in a kitchen that is both functional and beautiful. KITCHEN EQUIPMENT, BELLS & WHISTLES. Appliances should be some of your first selections for a new kitchen, because your appliance choices can drive the design of the entire kitchen. A visit to an appliance showroom will bedazzle you. You’ll have stars in your eyes, and dollar signs in your head. A high-end appliance package can use up a big piece of the budget, and you may even have to make some compromises. Almost all of the better brands are now energy efficient and perform well – some with more style than others. Most people still prefer gas burners and electric, or dual fuel, ovens, but magnetic induction surface cooking and steam ovens are gaining popularity. Many appliances are now available in drawer configurations, like microwaves, dishwashers, refrigerators and freezers. These are also great for rooms other than kitchens, like family rooms, master bathrooms and pool rooms. Also, since more new homes and remodels are designed with fewer walls and more windows, this requires optional under-counter placement of appliances. All of this is eating away at cabinet storage space, which demands greater efficiency in cabinetry storage features. At the same time, appliances are becoming hidden surprises, with cabinet fronts that provide a seamless appearance within the kitchen design. CABINETS SET THE STYLE. Selection of cabinetry may be the most important choice you make for your kitchen. Cabinetry establishes the style and overall look of the kitchen, so it is the most important aesthetic choice you make. And, because it should be the longest-lasting kitchen component and probably the single most expensive component, you will have to live with your cabinetry for a very long time. It should be the best you can afford, with efficient, space-saving, smooth operating storage features, and a beautiful baked-on factory finish that you will never have to refinish or paint. Your kitchen should be planned so that you never have to get on hands and knees to search for anything…it should come to you in drawers, roll-outs, swing-outs, pull-outs, etc. This hardware is the strong silent type. Look for quiet soft-close under-mount drawer guides and silent soft-close door hinges, dove-tail drawers and finished interiors, and a life-time warranty. Select finishes from quality-controlled factory-made samples. What you see is what you get. Don’t compromise on quality here! ON TOP AND DOWN BELOW. COUNTERTOPS AND FLOORING are a whole other subject. The topic of countertop materials comes up more often than almost any other kitchen component. Maybe it’s because there are so many material and color options, and countertops are the most heavily used surface in the kitchen. It’s not all set in stone anymore. There are some amazingly beautiful new materials available, mostly man-made. (Sorry, God.) Also, think about thick glass, or water-resistant wood countertops, sometimes with unusual textures, edges and configurations. These countertops are not just work surfaces – they’re works of art. Granite, marble and other natural stone has been losing ground to engineered materials for countertops, while backsplash areas create interesting artistic focal points of their own. Flooring selections are often made based on kitchen finishes as well as the adjacent areas that open up to the kitchen. While stone flooring is often preferred, easy-maintenance porcelain tile and easy-on-the-feet prefinished wood flooring are favorites, often mixed with borders and patterns. GO GREEN. Most people, both consumers and within the design/build trade, are becoming very aware of the impact their choices have on the environment, and are looking for more eco-friendly options. Manufacturers of appliances, cabinetry, countertop and flooring materials, lighting, etc , have all introduced materials and products that qualify for LEED certification. Use of cork, bamboo, reclaimed wood, recycled and repurposed materials, as well as low and no-VOC paints and varnishes are available. KITCHEN FUTURE. Every year, manufacturers exhibit at the Kitchen & Bath Industry Show to introduce their new products, and tease us with what is on the minds and the computers of their engineers. We heard about refrigerators and other appliances which connect to the internet, enabling you to control or monitor them from your office or across country. Your refrigerator will tell you if you’re out of milk or if the milk you have is expired. It can even make a grocery list for you. You can turn on your oven to preheat from your smart phone on the way home from work. Appliances will let you know if they’re not working properly or need service. “Counter Intelligence” – countertops with sensor sections that work like an iPad, and countertops with integrated electronics that allow you to cook almost anywhere on them. How about an indoor herb garden on the countertop with grow light? What’s in your future? YOUR KITCHEN. Whatever floor plan, cabinet style, finish or colors you prefer, keep in mind a few basic guidelines for a successful project. 1) Proper planning in advance is critical. Work with a professional, and allow plenty of time to make decisions. Be open to suggested design changes during the design process. Changing the design after the project is under way can break the budget. 2) Don’t skimp on quality of cabinetry or labor for detail work. Small mistakes can result in big disappointment that you will look at and live with every day for a long time. Despite how it appears on HGTV, it will probably take a long time and a lot of money to plan and build out the kitchens you see on TV and in magazines. It will be worth it though – and YOU’LL LOVE KITCHENS TOO!